Fall Line Fest rolls back into town Friday and Saturday nights with 50+ bands at six local venues turning the weekend into musical insanity. You’re going, right? I had a blast last year. Head over to RVA Playlist’s Fall Line Fest Beginners Guide to get started. I’m working on my schedule as I type this — so many choices! Building on the success of last year’s exclusive Fall Line Fest ale from Hardywood, organizers have raised the bar by teaming with Hardywood and Starr Hill breweries to collaborate on this year’s beer. Aptly named by RVA’s own Page Hayes, “Fall Line Fest Amped Up Ale” is a Farmhouse ale, dry-hopped with Sorachi Ace and Mandarina Bavaria hops and spiced with fresh local ginger. I’m hearing from multiple sources that it is quite delicious. 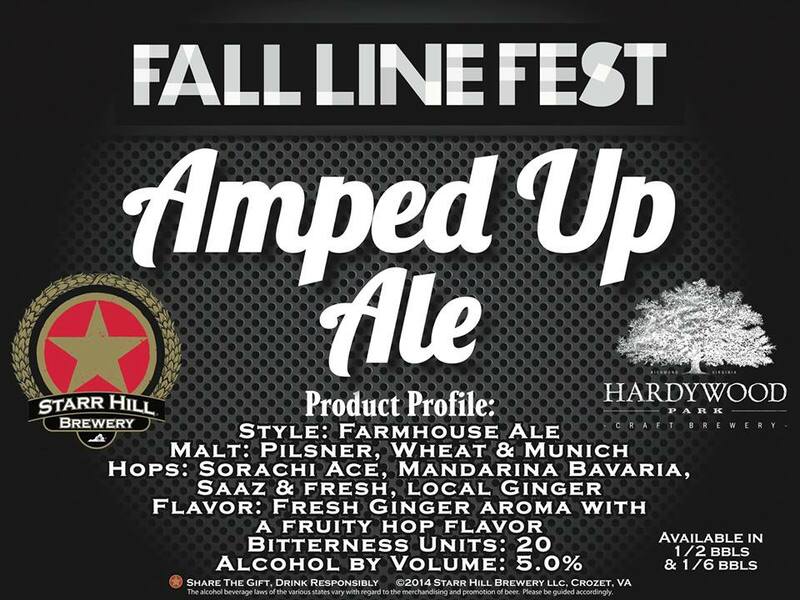 The beer debuted for a short time in Starr Hill’s taproom but will be served exclusively at Fall Line Fest venues as well as key accounts involved with the festival. I think for us, collaborating with Starr Hill was probably long overdue. When the idea was proposed to create a beer together for Fall Line Fest, you could see and hear the excitement building as we all discussed what was possible…In the end, I think we captured the brewing styles and concepts of both breweries in the Fall Line Fest Amped Up Ale. Cheers to Robbie O’Cain and the Starr Hill crew for helping to make this beer excellent—the only thing left to do now is bring on the music! It is always great to work with Virginia brewers, especially when it involves new ingredients and new processes. One of the great things about the industry, especially in Virginia, is that we share ideas and process knowledge while maintaining our own unique way of doing things…Brian Nelson and the brewing team at Hardywood did a great job with the pilot batch, which allowed us to hone in on the final recipe. We are excited to present this beer in collaboration with our good friends at Hardywood, and we hope Fall Line Fest patrons will enjoy this brew while listening to some awesome music. Get you tickets here, drink the beer, and have an awesome time!